Interventions including LVAD supported PCI; Structural Heart Interventions including Percutaneous ASD and PFO Repair, Mitral Valvuloplasty, Percutaneous Mitral Valve Repair, Aortic Valvuloplasty and Percutaneous Aortic Valve Replacement; Peripheral Vascular interventions including Limb Salvage Revascularization, Carotid Stenting and Percutaneous Repair of Abdominal Aortic Aneurysms. Dr. Smalling is a native Texan who received a degree in Aerospace Engineering, master’s degree in Bio-Medical Engineering (ME Department), and Ph.D. from The University of Texas. He is an AOA graduate of The University of Texas Medical School at Houston and completed residency and cardiology fellowship at UCSD. 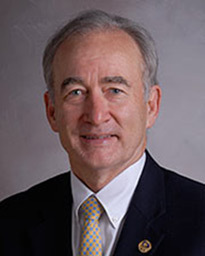 Dr. Smalling is board certified in internal medicine, cardiovascular medicine, and interventional cardiology and is past president of the American Heart Association, Texas Affiliate. He has been honored as a Distinguished Alumnus of UTHealth in Houston and the College of Engineering, University Texas at Austin. Named an America’s Top Doctor for the past fourteen years, Dr. Smalling has received a number of professional and service awards including the Distinguished Service Award from the AHA Texas Affiliate. He is on the editorial boards of Catheterization and Cardiovascular Interventions and The Journal of Interventional Cardiology. In addition, he holds several patents and has co-founded a company, Windmill Cardiovascular Systems, to produce a new implantable left ventricular assist device. Dr. Smalling specializes in the treatment of adult congenital heart disease, and valvular heart disease percutaneously as well as peripheral vascular disease interventions including carotid stenting and percutaneous endovascular repair of abdominal aortic aneurysm. Additionally, his team is experienced in utilizing left ventricular assist devices to support high risk coronary angioplasty and complicated valve treatment procedures. His research interests include advanced intravascular imaging procedures for coronary artery disease, mechanical and pharmacologic reduction of ischemic myocardial injury and developing advanced heart attack treatment systems. Dr. Smalling is the author of over 240 Scientific Papers, 145 abstracts, 25 book chapters, 2 books, and more than 15 web based CME articles. He and his wife Sharon have 3 children, Geoffrey, Elizabeth and Stephanie and 2 grandchildren. They enjoy cooking, cycling, skiing and traveling together. Dr. Richard Smalling and the team at Memorial Hermann-TMC helped Dawn after she suffered a heart attack. Cecilia Figueroa started feeling sick about the ninth week of her pregnancy, so short of breath from walking just a few steps that she felt like she was about to pass out. Port Arthur doctors confirmed what Figueroa already suspected: The problem was a heart valve transplanted a few years earlier because congenital kidney problems had caused so much damage to the original. Figueroa sought second opinions from doctor after doctor, but none offered any real hope until she found her way to a Texas Medical Center cardiologist daring enough to propose a cutting-edge, minimally invasive procedure not exactly envisioned for expectant young mothers. The procedure was developed for and tested on the frail and elderly, but Dr. Richard Smalling, who is affiliated with Memorial Hermann Heart & Vascular Institute-Texas Medical Center, saw no reason it shouldn’t work in Figueroa.